In his June 5, 2013 Opinion in the case of Bruce v. McCann Education Centers, No. S-467-2010 (C.P. Schuylkill Co. June 5, 2013 Goodman, J. 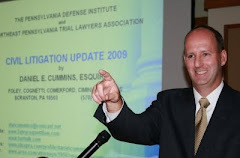 ), Judge James P. Goodman of the Schuylkill County Court of Common Pleas granted summary judgment in favor of the defendant in a slip and fall case. According to the Opinion, the Plaintiff alleged personal injuries as a result of allegedly slipping and falling on water and/or other liquids that had been spilled on the floor in the area of the Plaintiff's fall and/or tracked there from a nearby cafeteria in the school. After discovery was complete, the defense filed a motion for summary judgment primarily asserting that the Plaintiff could not identify the substance or debris that caused her to fall and could not state how long that substance was present prior to the Plaintiff's fall. The Plaintiff countered by arguing that, even if she could not identify the exact substance that allegedly caused her to fall, she could present her own testimony as to the cause of her fall, pictorial and testimonial evidence that she fell in an area where there were commonly wet or dried spills on the floor, and that there was no janitor on duty at the time. According to the Opinion, the record before the court contained evidence that it had rained earlier that day, that the Plaintiff admitted that she never saw any substance prior to her fall, and that the Plaintiff admitted that her clothes were not wet after the fall. There was also testimony from an eyewitness who testified that he observed the Plaintiff walking backwards out of the cafeteria while talking to someone in the cafeteria at which point the Plaintiff tripped over her own two feet and fell. After thoroughly reviewing the law of premises liability, the court ruled that the Plaintiff could not establish a breach of any duty on the part of the Defendants. Not only was the Plaintiff unable to specifically identify any substance that caused her to fall, there was no evidence to show how long any such alleged substance was located on the floor so as to allow for a finding of actual or constructive notice on the part of the Defendants. As such, summary judgment was entered in favor of the Defendants. Anyone wishing to review this case of Bruce v. McCann Education Centers may click this Link. I send thanks to Attorney Shawna Laughlin of the Law Offices of Thomas J. Kelley in Moosic, PA for bringing this case to my attention.